Last minute cake ideas usually do NOT turn out well. However, this one most certainly did. My son, now 17, decided he wanted to have several friends over for a bonfire for his birthday. No problem! We had the fire pit, could order pizzas, have a cooler full of drinks...but what about the cake? Well, the bonfire led to the Tiki idea. Tiki torches, oil lamps, etc (no grass skirts, though). 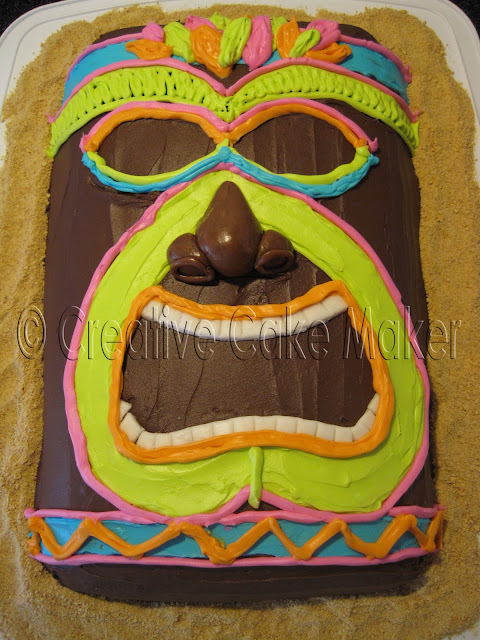 This guy was made from a 13x9"cake (I prefer using my Air Bake pan). Once the cake was baked, he took under an hour to decorate. I've posted some photos of the decorating process below. Ice the cake completely with chocolate icing. You don't have to worry too much about getting icing on your surface. It will be covered up later. Keep your strokes going vertical - to somewhat resemble tree bark. 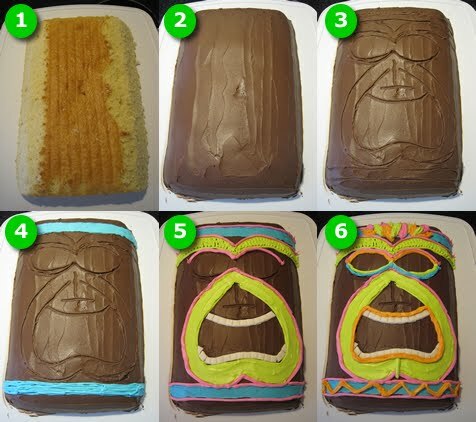 Use a toothpick, knife, chopstick or whatever you have handy to trace the design of your tiki man's face. Don't worry about adding details at this point. You just want to be sure you have the basic design centered on the cake surface. Now comes the fun part - coloring it in! Try to stay in the lines. Fill in all your base colors first, then do your outlining. The icing colors were made with a couple cans of vanilla icing and neon food coloring. The teeth were made with marshmallow fondant. I rolled out a sheet, cut out 2 strips and indented them to look like teeth. Continue coloring in the areas and add details (like the zig-zagging and the headband feathers). The final touch was the nose - made of tootsie rolls. The tootsie rolls (about 6 minis) were warmed in the microwave and molded into 3 balls (2 small and one large). The large ball was rolled into a cone shape and the smaller balls were attached to either side. The entire base of the cake was surrounded with graham cracker crumbs to resemble sand. And there you have it! A quick, easy (and Yummy) last minute Tiki Man birthday cake! Wow! Can't wait to try this, I know what u mean by last minute stuff ahaha I always get last minute orders n this is great to learn for a luau Party thanks!